With the rise of mobile devices capable of playing video games, many traditional video game companies began to create versions of their games for those devices. 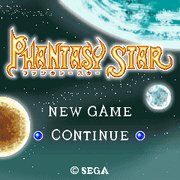 Sonic Team converted many of Sega's early games to mobile format, including Phantasy Star. This remake is called Phantasy Star: Deluxe Edition. Deluxe Edition is closer in form and format to the original game than Phantasy Star generation:1, but still has many differences. Many graphics from the game have been improved, but still bear a strong resemblance to the originals. Specific game play details, such as dungeon layouts, are almost entirely to the original game's information, offered below.